The love of learning begins early. Sacred Heart's experienced preschool teachers are dedicated to working with pre-kindergarten students and laying the foundations for future student achievement. Two adults per class in the securest rooms in a secure school. Safety is not an afterthought. Meaningful, age-appropriate lessons provide a fun learning environment. Our teachers love working with preschool, and your child will love working with them. The Sacred Heart Catholic School (SHCS) preschool program provides a loving, structured environment for the faster cognitive development of strong students. The program provides parents a safe, secure and fun way to develop skills for a childhood filled with positive learning. Our Little Raider Academy is a great way to get a headstart on your child’s education. Little Raider Academy has two levels. They are PK3 and PK4. Sacred Heart’s preschool program is licensed by the Virginia Department of Social Services. Pre Kindergarten 3 or PK3 students are introduced to a range of new concepts. Learning and fun work well together with the PK3 students. PK3 provides introductions to basic concepts, such as number recognition, counting to 100, letter recognition, sounds, colors, and shapes. Students are also introduced to the seasons, weather, and holiday celebrations, including religious meaning. Plant and animal life cycles and their needs are introduced. Daily storytime allows for language development and associated activities in a fun, engaging way. Art and crafts activities allow for large and fine motor skills development. Time for constructive, creative play is provided and encouraged. Students learn both A to Z capital and lowercase letters, including recognition, use, and writing. Students are taught first, last, and written name recognition. The seasons, weather, and parts of the calendar, to include days, weeks, months, and years are part of daily instruction. PK3 students have weekly participation in music, gym, library, and technology classes. 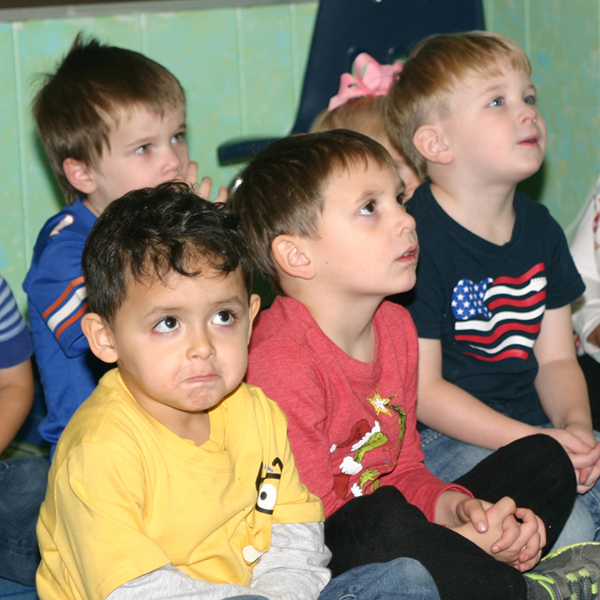 They will interact with other students and different adults during these times, which provides natural opportunities for all PK3 students to expand and grow their socialization skills. Structured lessons provide rewarding experiences. Pre Kindergarten 4 or PK4 builds on the foundations taught in our PK3 program. While PK4 students are exposed to new concepts and ideas, the goal is to teach them until mastery. PK4 provides a stronger focus on basic concepts. Subject areas also become more defined. Students continue to develop their command of numbers – formally 0-12, introduction to simple addition and subtraction, counting by 10’s and graphing. Students learn both A to Z capital and lowercase letters, including recognition, use, and writing. Color recognition covers both primary and secondary colors. Eight basic shapes are mastered. PK4 students learn pre-reading and reading strategies. Students learn first, last and written name recognition. With sounds, they learn kinesthetic and tactile hand signs. They are introduced to rhyming words. Teachers work more on their student senses at PK4. Sights, sounds, and smells are incorporated into learning. Development of the student’s fine and gross motor skills continue. Self-control with emotions and proper behavior is taught to a much greater degree. Safety concepts within the school/classroom, playground, and home are taught. Science and technology subjects expand at the PK4 level. Students learn about the seasons, weather, and parts of the calendar, to include days, weeks, months and years. Students continue exploring animals and plants subjects introduced in PK3 and are introduced to topics like age-friendly dinosaurs. They learn basic parts of the human body. They are exposed to classroom computers and iPads. Students begin learning basic keyboarding skills. PK4 students are provided more exposure to Christian and Western concepts. They are introduced to history and current events. They are taught basic concepts of country and freedom. Additionally, all Little Raider Academy students receive weekly instruction in the library, technology, music, art, liturgy, and physical education from specialized educators. They also participate in school-wide assemblies, special events, and performances.